I think I’ve avoided publishing these last entries so to prolong the sense of being in the road-trip dimension. Handwritten notes that I made through our journey call me to expand into posts. There is a meridian of poetry still pulsing. And photographs or video to share–which takes time to curate. We’ve started back to work but I’d like to keep connected here with you for a little longer as Karen and I circle back mentally to regular home, regular routine while trying to keep the heart-road-map present in our minds. Our southern Ontario autumn reminds me of the light of the Midnight Sun. A good long warm, and the hot is strong but not overbearing. Ontario’s summer is accentuated by dense haze, steamy fields and pavement, and humidity drooping thousands of leaves so that even the greatest of trees appear parched and weary. The Arctic summer has a precise sun. It’s marvellous sustenance through what-would-be-night, inspires anytime action, play, and exploration. Viewlines are drawn to an owl swooping to prey or a bear travelling across tundra foothills. Ravens clamour and keen, their language circling back to us like excited words calling connection. Having been North means I check Inuvik, Tuk, and Whitehorse weather occasionally and am more attuned to North of 60 media that manages to seep into our southern news. Here in Toronto, we all LOVED our mid-November 15º. It was -22º in Inuvik. 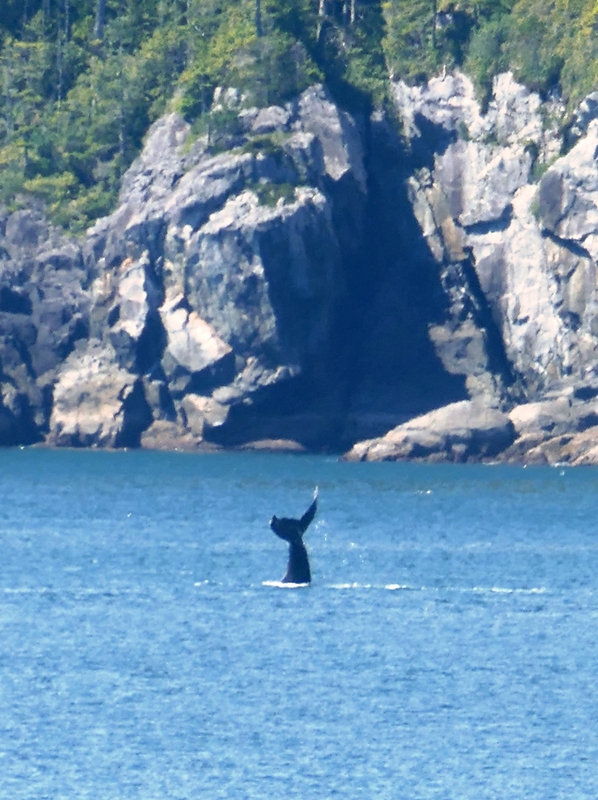 A whale takes a dive in the inside passage, mid-way down the coast of B.C. Time in the Midnight Sun feels endless and unmoored. Night undifferentiated from day, the light is music without metronome. Karen and I inhaled the sunlight’s energy and enjoyed setting camp at 10 pm whenever we decided to travel long past supper — just the two of us on wireless roads and wilderness highways. And when we were on the Yukon River, the long light lent us respite from pitch black fear. Time clocked longer, slower –and it was palpable. We talked about being on leave from our regular lives, being under midnight sun, just being in a qualitative different way of being. Indeed all such factors contoured our journey map. Turns out, time is measurably different depending on where, on Earth, you stand. Time is variable. For one thing, we humans measure time in a 24-hour cycle. However, a solar day –the time from one sunrise to the next sunrise–is never exactly 24 hours long. Its length varies throughout the year. Further, our earth moves in an elliptical path around the sun. And because of the earth’s tilt, if we were to visually chart the sun at the same time every day for a year, we would see a figure 8 or infinity symbol. This is called the solar analemma. And even then, the ∞ would sport one loop wider than the other with precision imbalance. The Equator is 2.3 times longer than the Arctic Circle–where the distance around the earth is 17,662 km. Earth rotates every 24 hours. At the Arctic Circle, you travel 736 km/hr and at the Equator, 1669 km/hr. 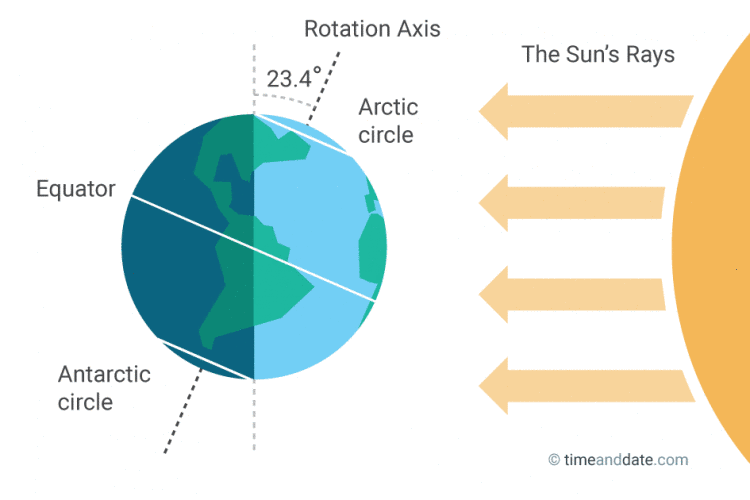 With Earth’s curve, sunlight strikes the Arctic at a different angle than the equator. I felt this lovely light like Ontario’s autumn. And the Arctic darkness is also different. How does this influence the experience of time and the universe? In the Arctic and sub-Arctic, the Noon-Moon is winter’s phenomenon — the celestial sister to summer’s Midnight Sun. Karen and I visited Whitehorse YK early December 2014 to see the Northern Lights (photo below) and we experienced 10 am sunrises and 3:30 pm sunsets. But I’d love to travel further into the shimmering darkness that follows the winter solstice. 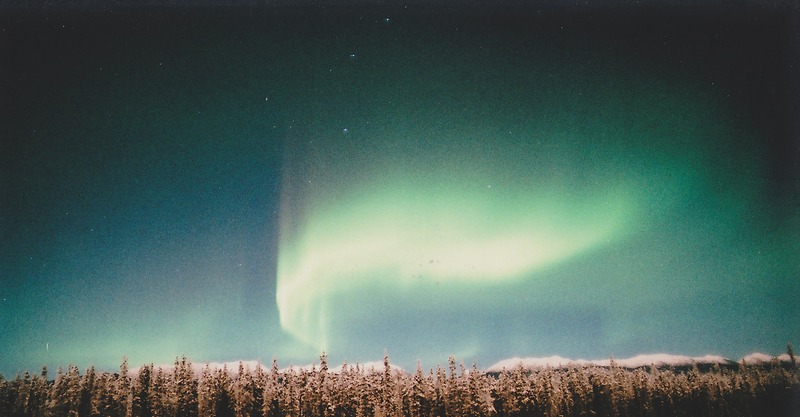 The masthead for this site has another photo of the Northern Lights taken from that trip. This country we call Canada is unfathomably vast and diverse–geologically, culturally, and celestially. The North gifts and challenges us with the extremes of change. Being North lets us open shutters to the dance and stillness of sky that in other parts of the world, simply go unseen. 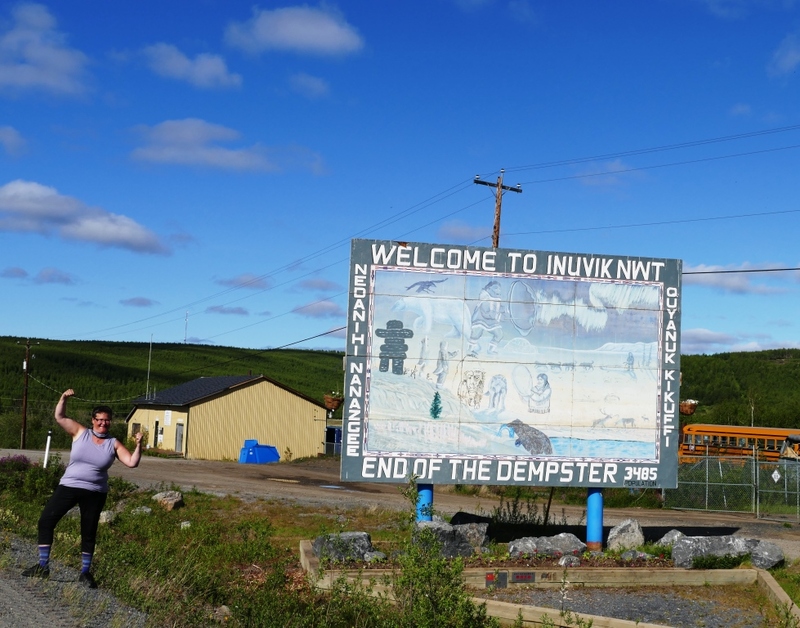 On a high from our Tuktoyaktuk adventures, Karen and I decided to seize the daynight and we departed Inuvik, NWT at 7pm to travel the 766km dirt road south to Dawson City, YT. We had our full 26-litre gas can, spare tires, food, water, and eager desire to revisit our university days and pull a true all-nighter. 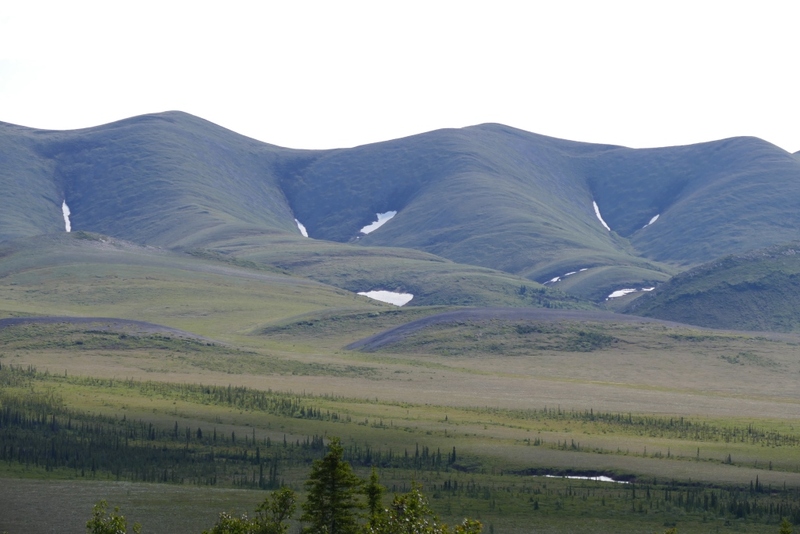 The road took us from the flatlands of the Mackenzie Delta into rolling Richardson Mountains and thoughtful vistas. 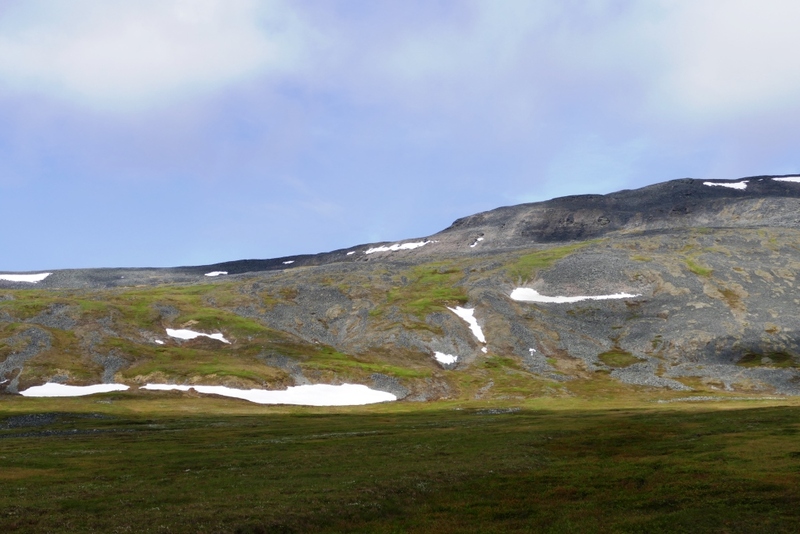 Fields of snowy cottongrass bordered the rise of tundra foothills hosting summer golden grasses and orange lichen outcrops.The standing sun honeys exposed soil, burnishes rock outcrops and highlights the pools of lichen. A few north-bound trucks and pick-ups had passed us early in the evening but by the Arctic Circle rest stop, we’d been road-alone for hours. By 1am we arrived in Eagle Plains. The motel and humming transport trucks slept while our little hatchback drank up our emergency fuel. Throughout the Yukon, we’d read bear warnings at trailheads, outhouses, gas stations, and rest stops. Motorcyclists taking the Dempster had reported being chased by grizzlies. 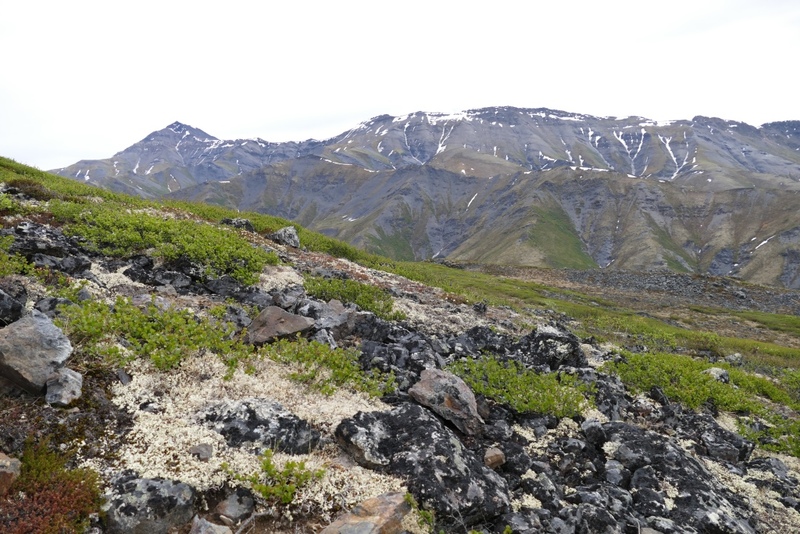 Even in Inuvik, residents warned us off hiking the parks and hillsides because of encroaching bears. While we’d had black bear encounters through each province, we were wondering if all the grizzly hoopla was just territorial hype. By 1 am we saw our first –heavy deep brown fur traversing the eastern tundra rise, his shadow fattening behind him. 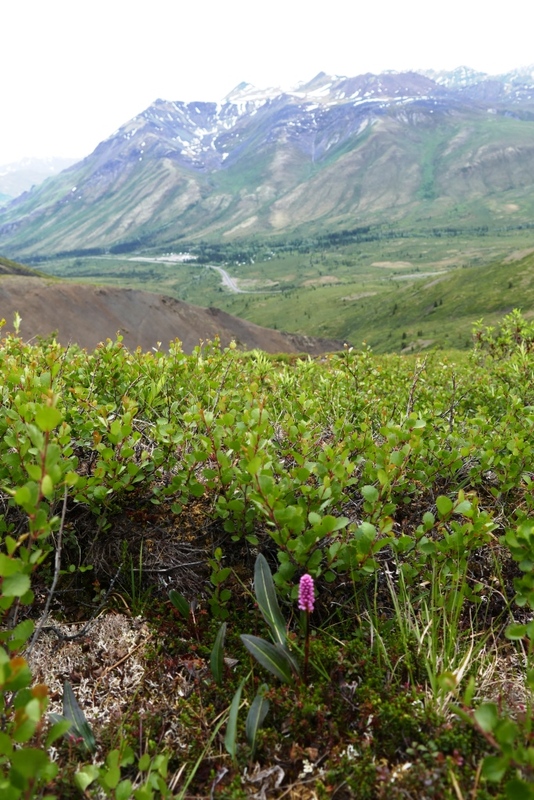 Speed-rambling, he paused over dwarf shrubs of green arctic willow to snout the air. 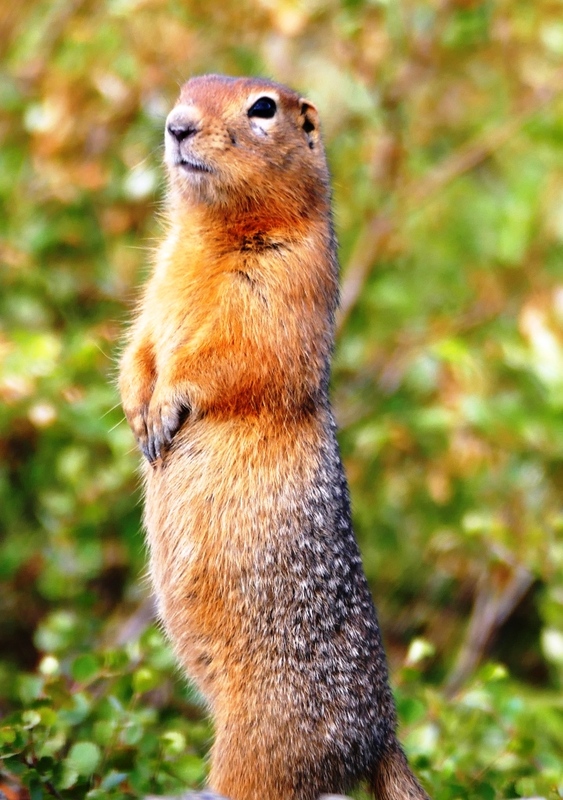 By 2:30 am, we stopped again to watch and film a hunt as another bounded up and down trying to grab her prey (likely hoary marmot or Arctic ground squirrel). 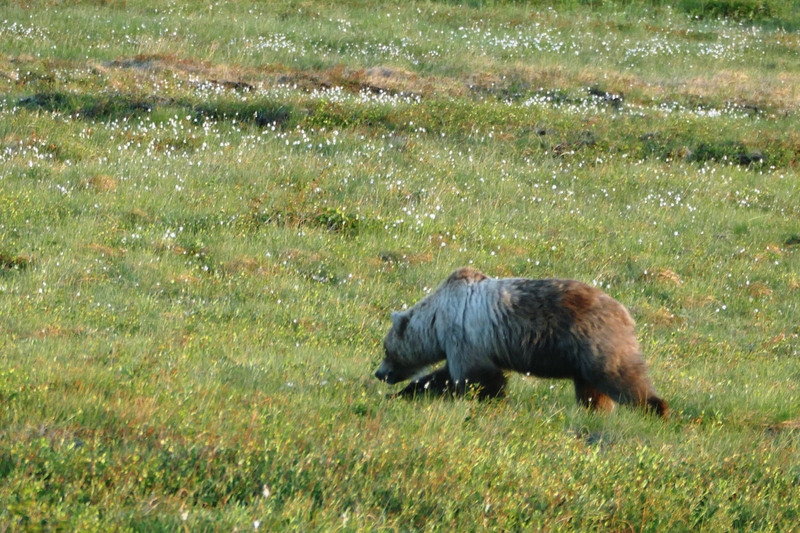 Later, yet another Yukon blond was gorging on wildflowers alongside our car. 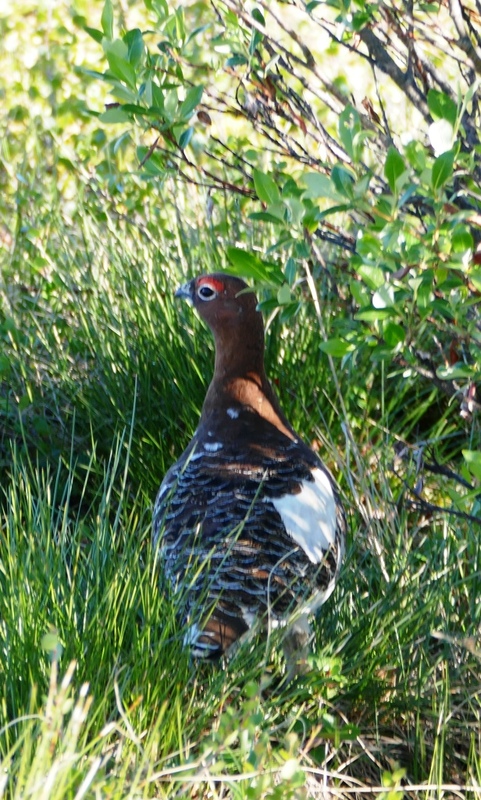 In all, that overnight drive under bright blue sky and steady sun gifted us 7 grizzly sightings, owl, golden eagle, ravens, dall sheep, porcupine, snowshoe hares, Arctic ground squirrels, loon, merganser, and, at 6am, a lone moose swimming in Two Moose Lake about 100 km from the end of the road. 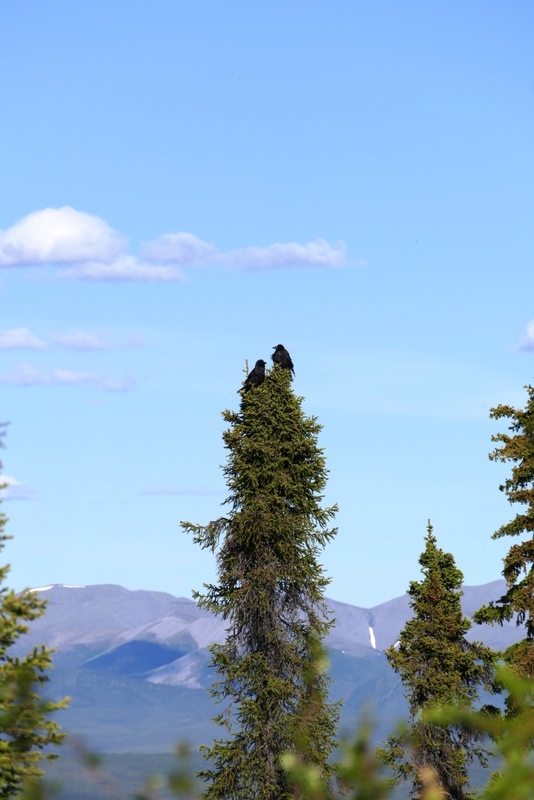 To get an idea of the road and the grizzlies, you can check out our VIDEO Dempster Highway Overnight with Grizzlies. 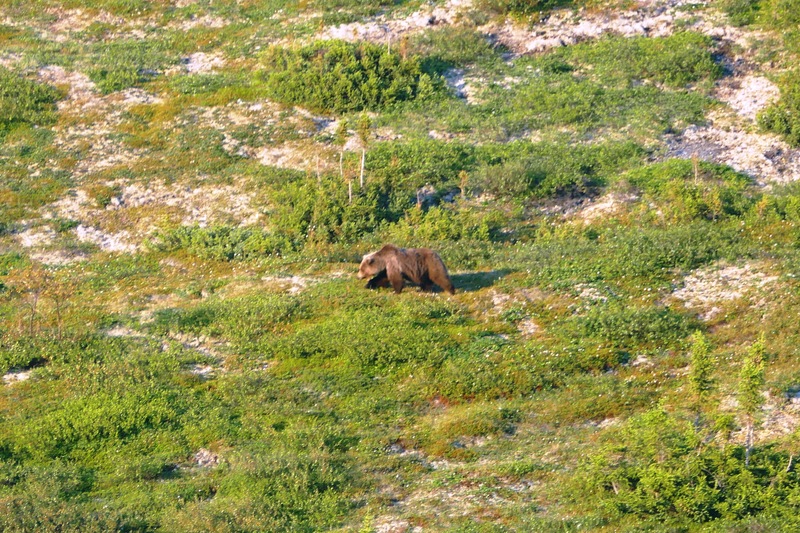 And here’s a link to Yukon Grizzly info. 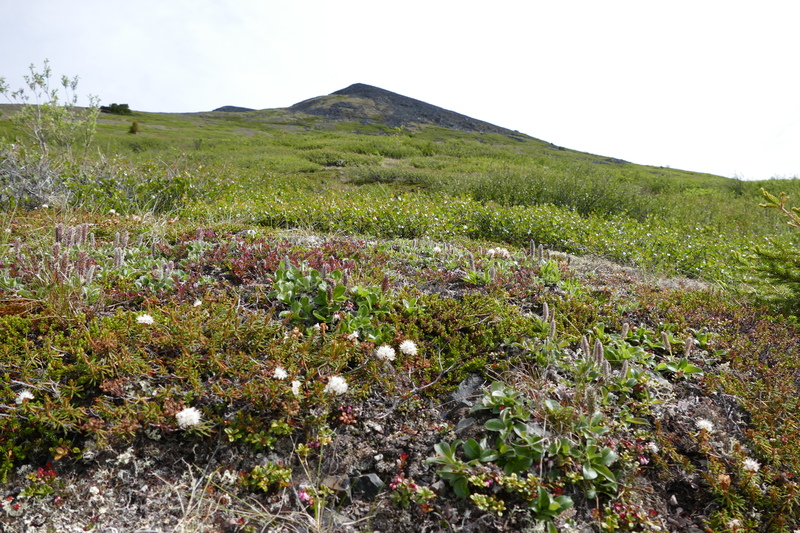 The next day we tried to set camp in the southern Yukon to find that tents were barred from the campground because the high protein, grizzly-loving soapberries were in bloom. We photographed the warning sign with said plant and then slept by the roadside, bear spray by our heads. Chris took us around Tuktoyaktuk, passing by the community centre, water treatment plant, school, and nursing/hospital station. He talked about how the ancestors would canoe to the Pingos to spot belugas; and how driftwood that travels thousands of kilometres up the Mackenzie River to rest in Tuk harbours, continues to be a valuable resource. Chris explained that they are just one or two generations off the land, and that the people now live a blend of traditional and modern. He shared with us how his childhood included fishing all day on the ice with his father then spending evenings with family listening to CBC Radio’s Hockey Night in Canada. 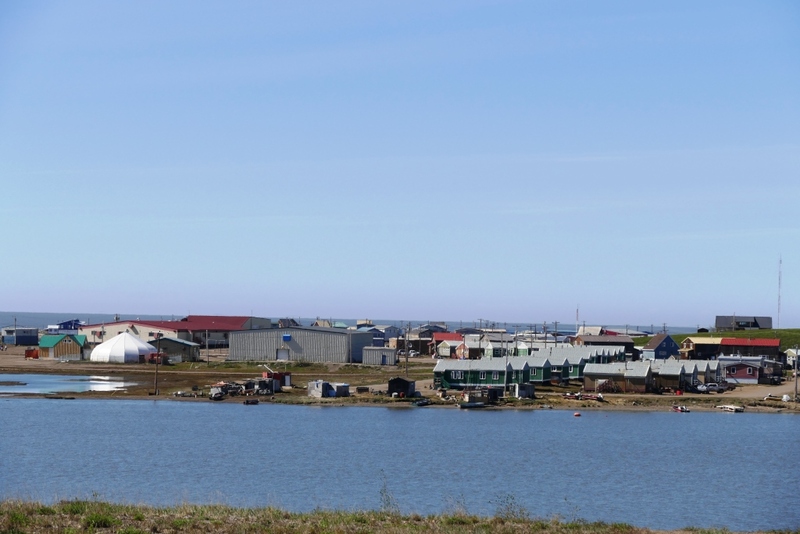 Like Inuvik, the oil and gas booms have come and gone in Tuk and may yet come again. Such cycles offer residents of this close-to-sea-level community a temporary boost to the (already ripened) fruit of goods and services rare in this part of the world. But when resource industries run their course, they leave in their wake, flat-lined drilling platforms, sagging industrial buildings, tilted barges, rusting fuel storage tanks, waterlogged caissons, and a stagnant market economy. Juxtaposed to these industrial reminders are distant one-room cabins, leaning slightly, greyed with age, and underscored by fingers of land that become summer islands. Tuk appears to be floating in the summer sea. The white bldg is community pool. 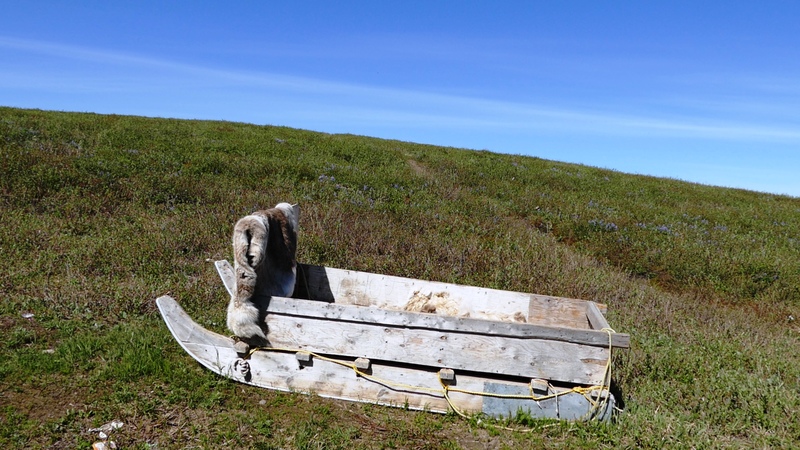 Because now they have tools to dig into the permafrost, a cemetery has taken the place of traditional burial –placing rock over bodies. Communities above the Arctic circle were subject to residential schools run by missionaries who would gather children by boat. Now Tuk’s community school teaches grades K-12 and about 150 students attend. How do a people who still gather, hunt and fish for their survival, integrate modern education? 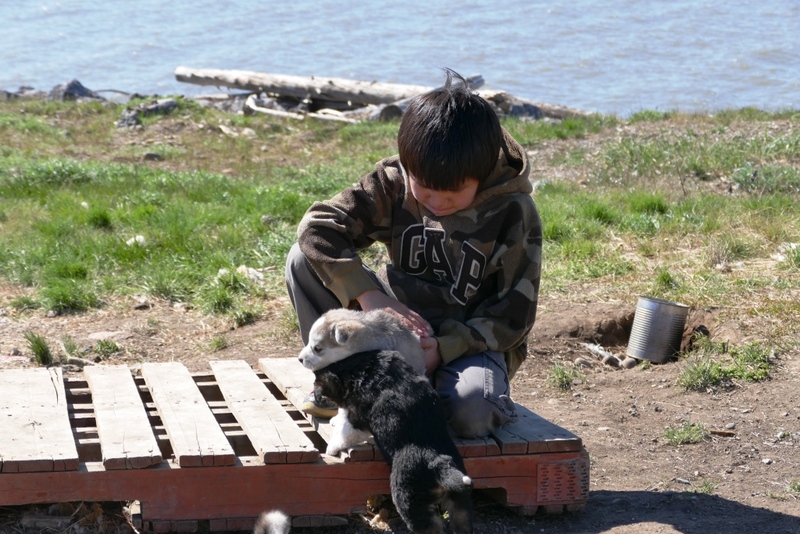 Education is esteemed in the community–but teaching subjects from a southern slant promotes cultural dissidence among Inuvialuit children and youth. 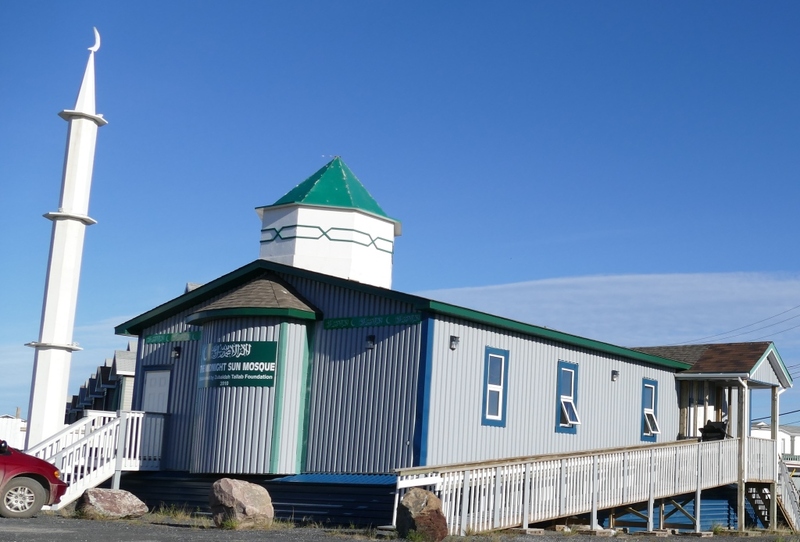 Throughout years of asserting self-determination, the people have successfully championed curriculum that reflects the northern and Inuvialuit experience. And educators are working toward more cultural relevance in the educational programs. Slowing for sandhill cranes and tundra swans, Chris talked about the extreme expense of basic groceries, winds getting up to over 100 km/hr, language connections with people from Greenland, and how barges transport supplies that can’t arrive via ice road–taking up to a year to get to Tuk via the Mackenzie River. He is clearly proud of his people and his community. As he talked, I felt that Chris expressed the great possibilities of Tuktoyaktuk life while living with what seem like the impossibilities of the Arctic. We visited the Trans Canada Trail monument which was laid in 2000 with the goal to connect the TCT as a continuous route from coast to coast to coast by 2017, the 25th anniversary of the Trans Canada Trail and Canada’s 150th anniversary since Confederation. 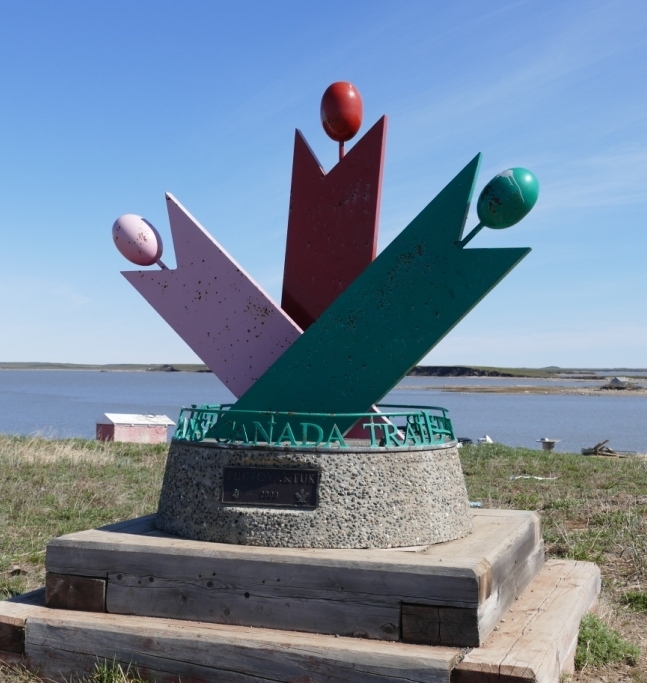 It also reminds residents of the promise by Prime Minister Diefenbaker in 1958 to connect the country sea to sea to sea. The Roads to Resources program was a plan to open up the North to development and to assert Canadian sovereignty as a counter to the communist threat at that time. 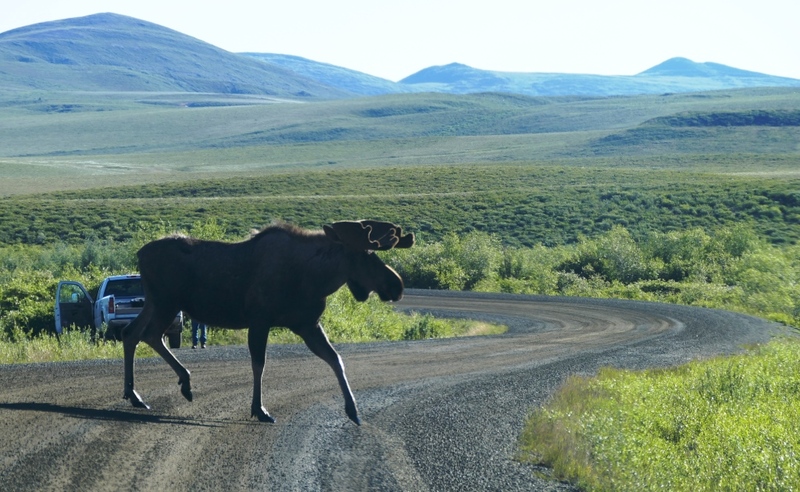 Now, over half-a-century later, the promised road will be completed in a few more years, connecting the Inuvik to Tuktoyaktuk. I wondered about that prospect– the last of their ice road and isolation. How the south/north experiment brings both growth and loss. How people adopt two (or more) cultures simultaneously while trying to live whole. The influx of sudden money then poverty; the confluence of ancient and now, tradition and change — all in this place where pingos expand and shrink, where brackish water is the resulting exchange between great river and ocean, and where the land lies shoulder to shoulder with the Arctic water frozen or flowing or both. The night before our departure from Toronto, we celebrated Nigel’s 19th in the CN Tower “Top of the World” restaurant. 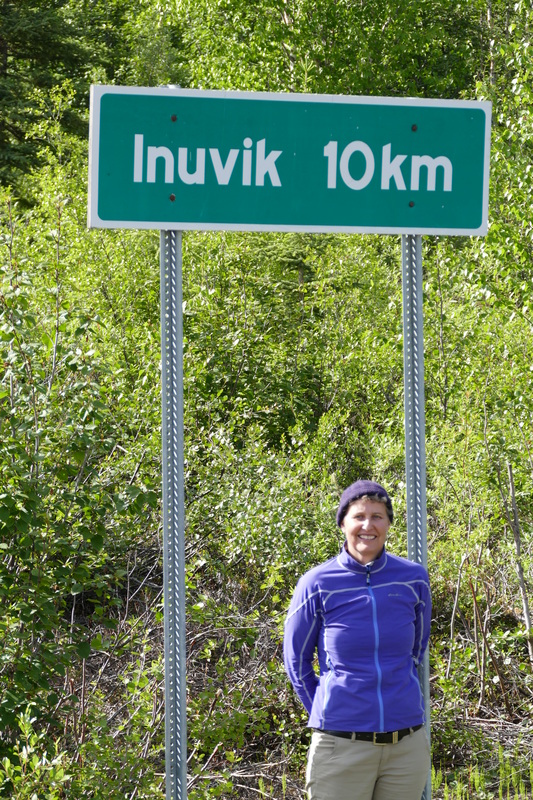 We also drove the “Top of the World Highway” from Dawson City into Alaska. This map however offers an obvious perspective: On Top of the World and we know–ahh now This Is North. 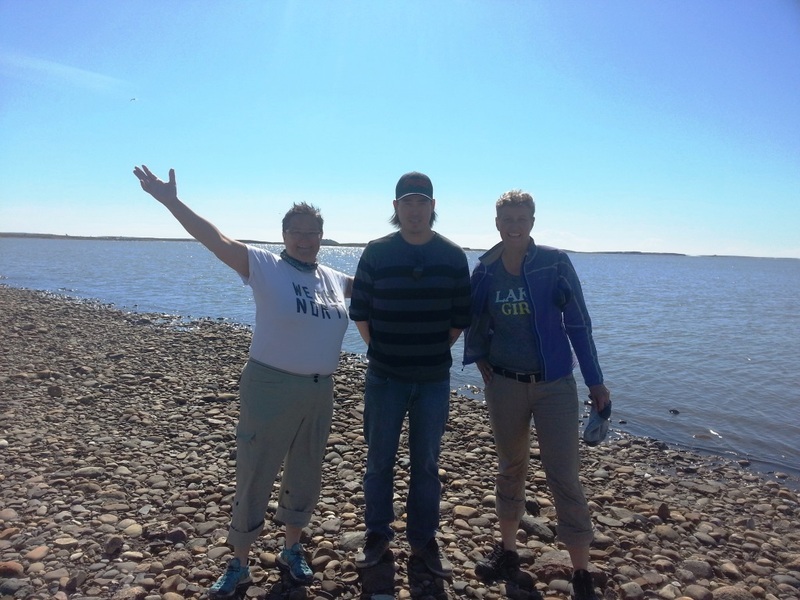 We took a dip in the Arctic Ocean (well, one toe-dipped, Karen waded, and I swam and immersed myself), then Quentin loaded us back into the tiny plane to return us to Inuvik. As “co-pilot” beside him, Quentin explained to me the dials, the rudder, compasses and talked me through a few pull ups on the steering wheel which doesn’t actually steer but lifts and drops the plane vertically. The whole day was an enjoyable, insightful, and thrilling experience. 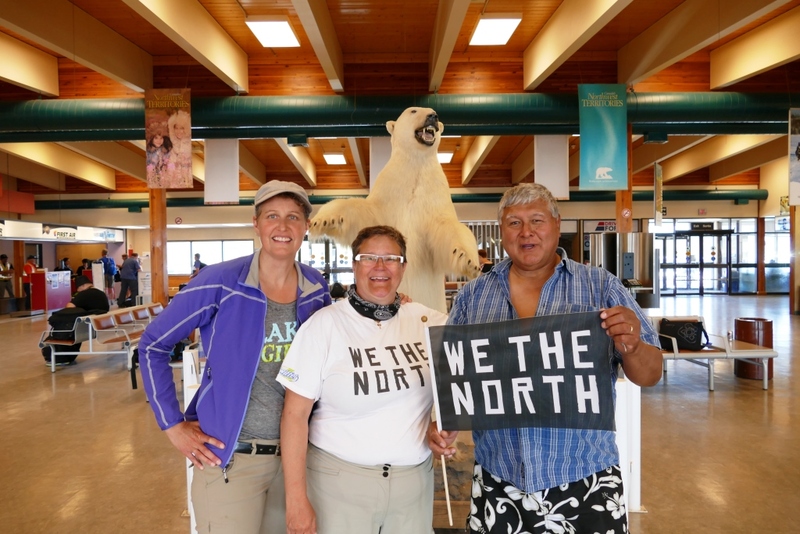 Karen and I are happy to have connected with Tundra North Tours and grateful to Chris and the people of Tuktoyaktuk for their welcome. 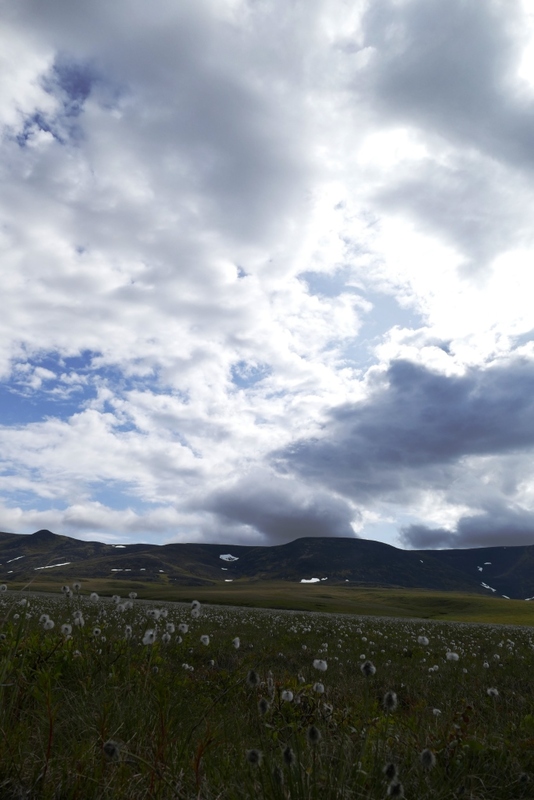 It was 7PM when we decided to begin our return journey on the Dempster. With the full sunlit-night ahead of us, we couldn’t resist pulling an all-nighter, just the two of us and 800km south to Dawson…. Karen and I approached the bush plane with a new-felt anxiety. 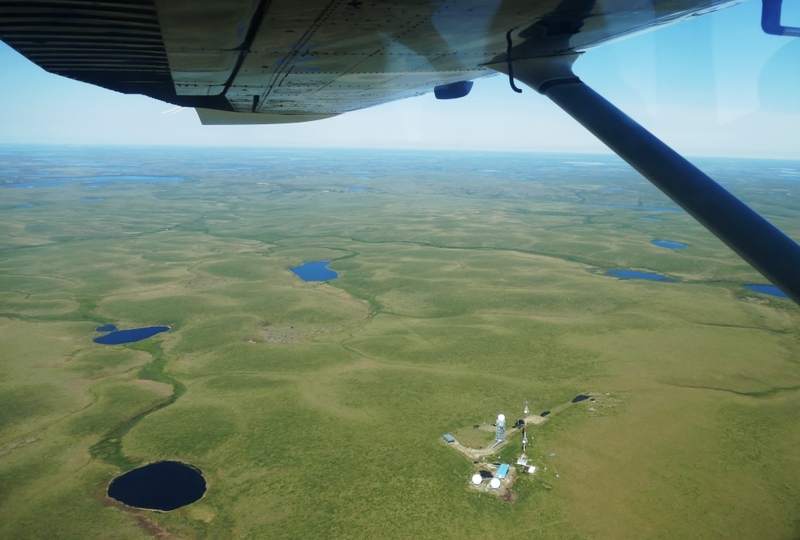 While in Inuvik, many encouraged us to visit Tuk so Karen connected with an Inuvialuit company and we set up a fly-in through Tundra North Tours. Our plane felt smaller than a min-van and with the single propeller engine, I sucked in my gut to help launch us into air. 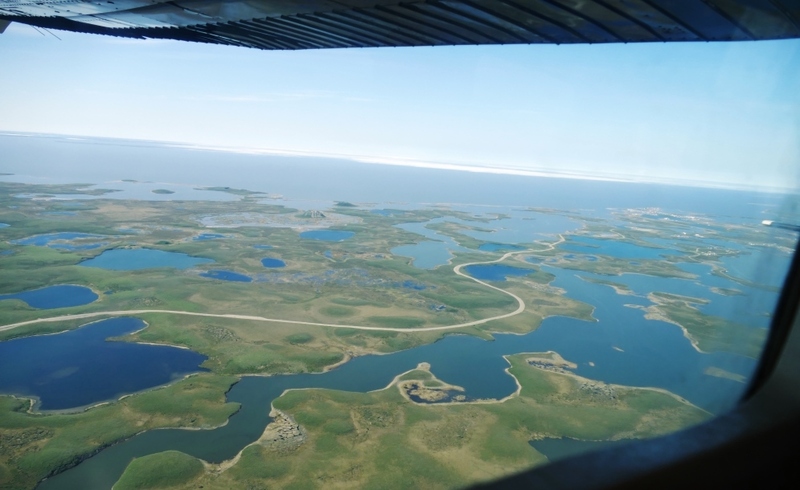 Tuktoyaktuk (Tuk) is the English version of the Inuvialuit Tuktuuyaqtuuk which means “looks like a caribou.” Tuk is connected by ice road for 3 months each year and is otherwise a fly-in community. 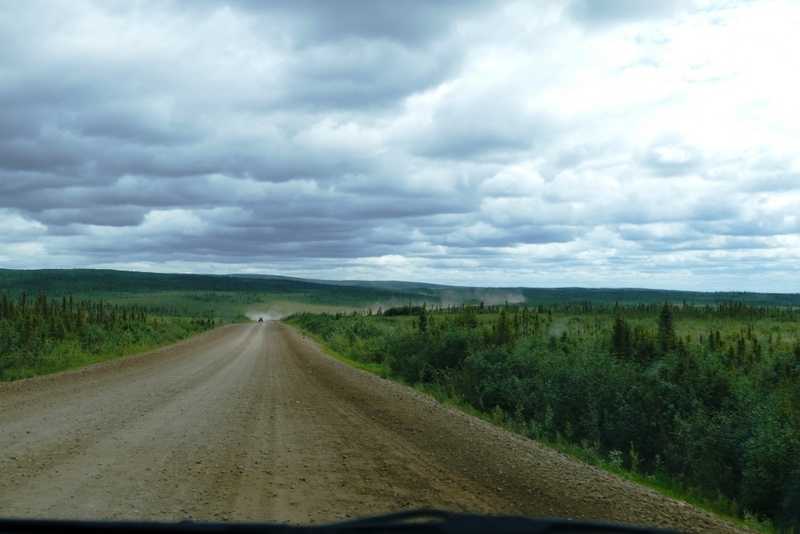 In the winter, there is a road under construction to connect Inuvik and Tuk all year. Final completion date is set for 2019. We saw it stretching precariously through the tundra sea (below). 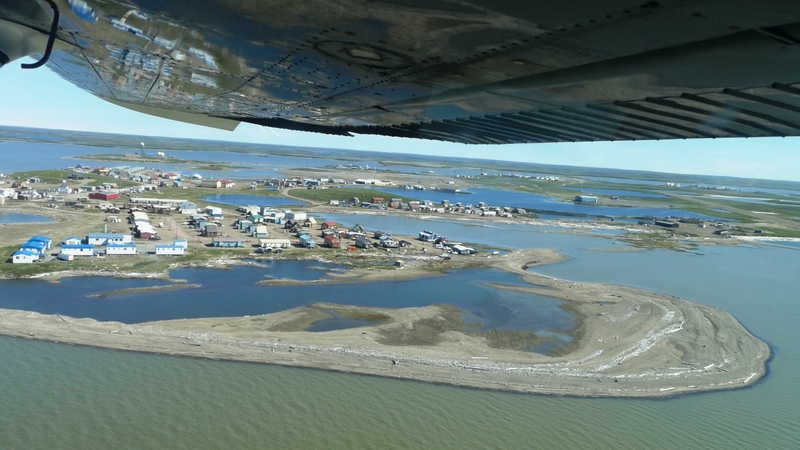 Above pics: Tuk “suburbs” and Ibyuk and other pingos; Karen ducks beneath wing. Coming Up: Our Bright Overnight Drive South down the Dempster or Just Us & plenty of the Grizzlies at 3AM! Inuvik has a stark layout that feels forced and awkward. 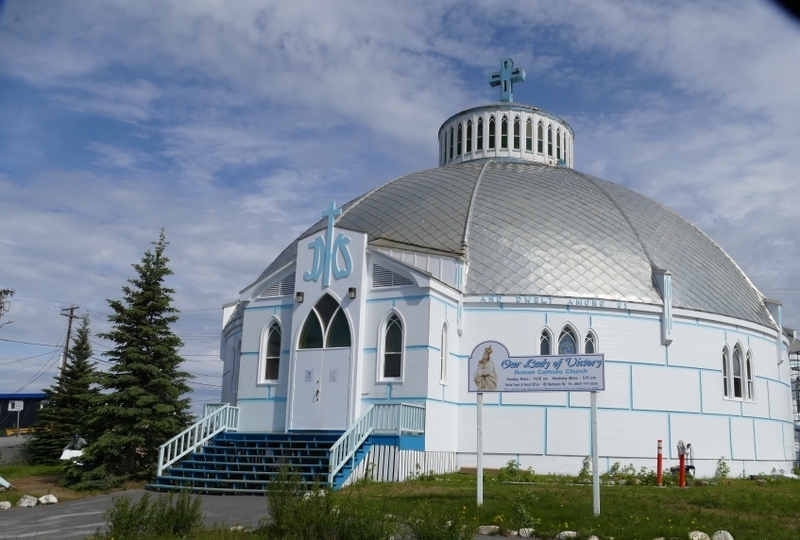 Except for the Midnight Sun Mosque, Our Lady of Victory Catholic Church, and the arena-sized greenhouse, most of its buildings are utilitarian drab. But Inuvik is inhabited by friendly, amiable, welcoming and spirited people. 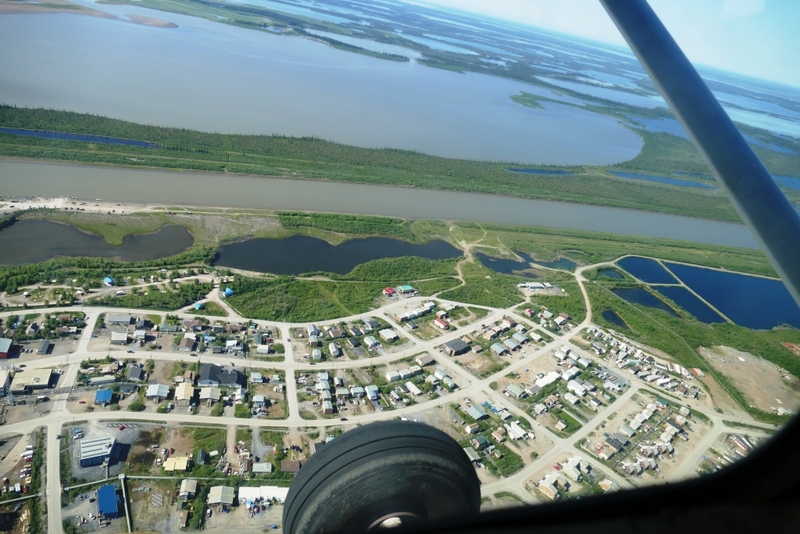 After many studies, Inuvik was built by the government of Canada as a planned community in the 1950’s and by the 1970’s became the first and only town north of the Arctic Circle. Structural support comes from the permafrost and the consequences of any thaw would be severe for roads and buildings. A few years ago, the sewage lagoon heated the ground, resulting in a road collapse. We dropped into the library to talk with staff and learn more about the unique history of this place. With about 3400 residents presently, the Town was established as a government administration centre and transportation hub. It has suffered its setbacks, and like most northern communities, Inuvik is subject to the whims of the global market. Prices for oil and other natural resources directly impact the living conditions of the residents as does government research or military presence. 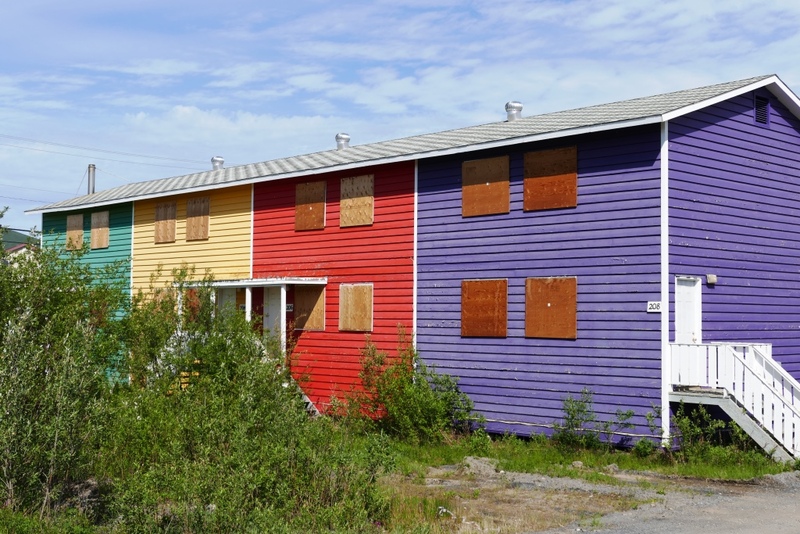 With the military no longer there and Arctic drilling at a standstill, a number of housing complexes were boarded up. But there is always a pipeline coming right around the corner and the people love the open wilderness land and the endless northern lights that dance the sky through their long winters. 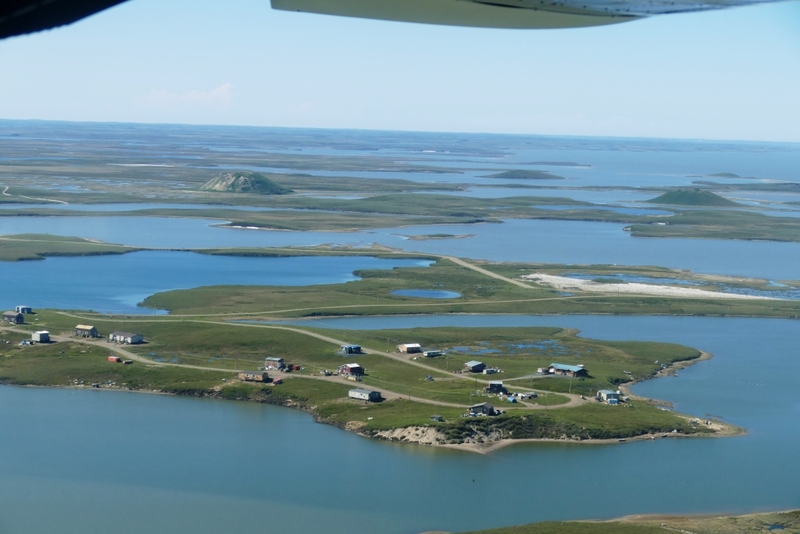 It is a blended community of Inuvialuit, Dene, Metis and Non-native. We even met a number of people who originally came from the GTA. Each and every one was happy to be there including a Sudanese man who returned to Toronto a decade after living in Inuvik and left two days later — bolting from the stress of the city. He’s a leader in the Muslim community and told us that the Mosque has about 100 members. 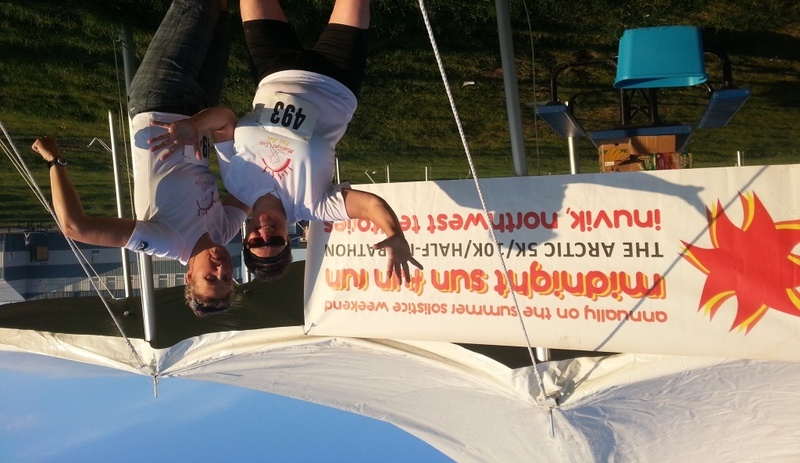 Karen and I registered to run in the annual Midnight Sun Marathon (organized by a man who used to live in Oakville!). We decided to try the 5k and we did great—coming in just ahead of the stream of walkers including a few pregnant women pushing strollers! 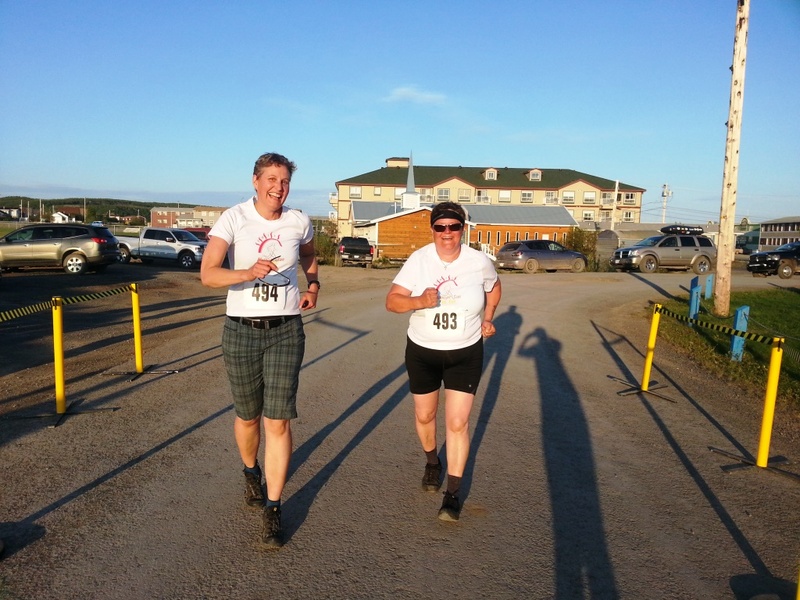 As we ran through Inuvik, we waved back to the people drinking beer and visiting on back decks, and smiled at the kids riding their bikes and playing at the park in the bright nighttime. 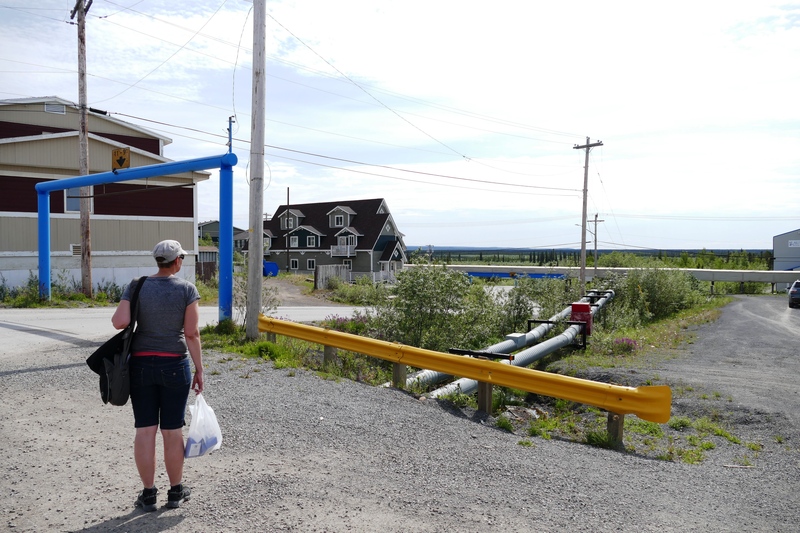 We jogged through the single traffic light at town centre, passed middle-income homes, industrial holding tanks, the gas station ($1.68/litre), campground and a section of roughed-up dwellings with a view to the delta. 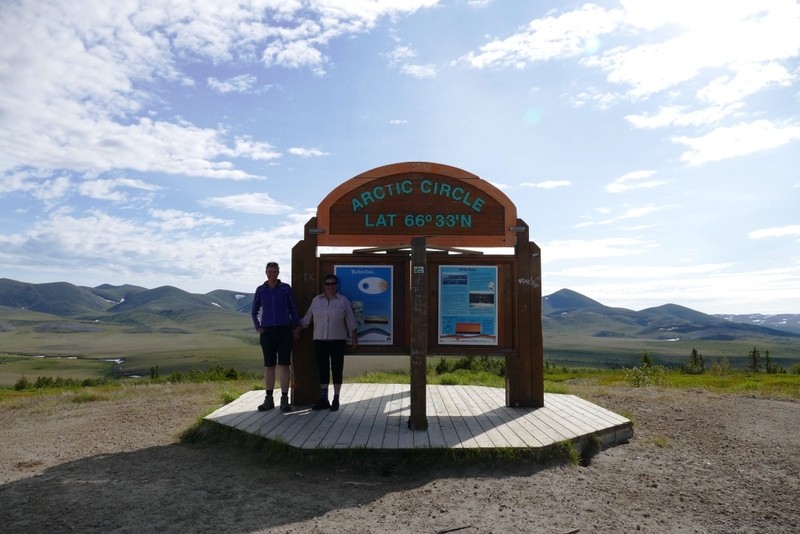 We crossed the Arctic Circle early in the day and conversed in halting, friendly English with a retired Francophone couple — and we’d exchange loud, happy greetings with them a few days later in the Inuvik library. Intersections open when you share a trail. Common trajectories become common delight, wonder, challenge. Our maps cross and we laugh and grin with familiarity. How simple it is to know others with whom you have fed a woodstove in a mountain campground, sheltered from the freezing rain; or roadside marvelled together facing the vast tundra, evening sun warming your face. Having last met them while hiking, we chanced again to see a young, romantic couple. She drove from Ohio then skipped her Alaskan cruise company interview in Juno so to stay connected with a German who’s travelling Canada. They’ve decided his 1970’s dodge van isn’t going to make it to Inuvik so they are southbound after stopping at the Arctic Circle. Her small hatchback parked back in Dawson presses a different decision. Travellers, campers, and brief rest-stop companions: we touch the easy exchange of where are you from and where are you going? With each conversation, another layer of why weaves into that recurring dialogue. 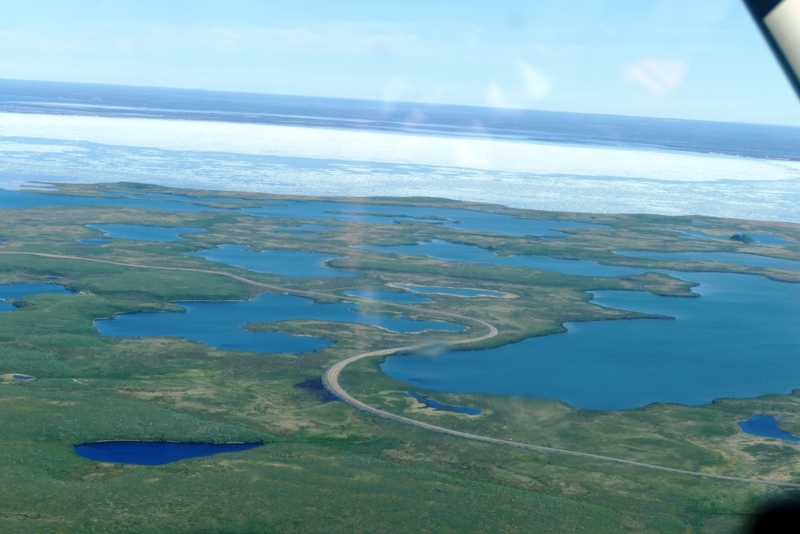 Closing in on Inuvik, the highway enters NWT and crosses the Peel and Mackenzie rivers on their way to the Arctic. 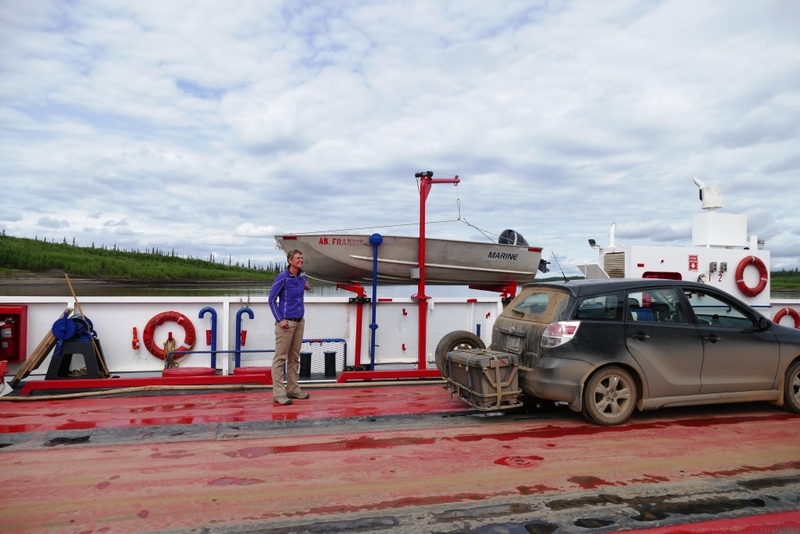 We take small service ferries across which host colonies of cliff swallows and their mud nests. Meanwhile, chortling ravens chase indifferent eagles low across the shoreline horizon–no matter where we go, it seems these sky creatures have either common argument or common play–probably both. Another long day-and-night’s drive through the open beauty of road-alone. Just the two of us sharing water, food, and holding hands — all eyes open with wildflowers and wildlife. And Karen and I realize that this trip has brought us far more strata of why than from what and when we’d first set out. 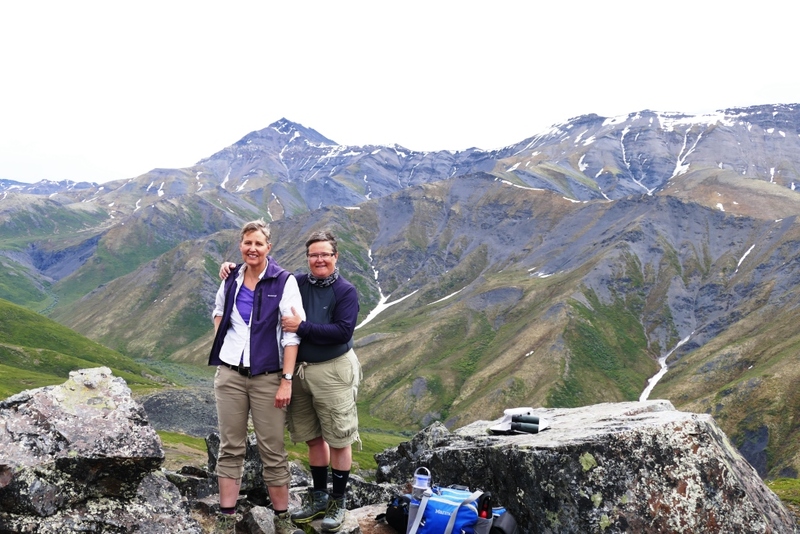 Driving the Dempster in June can mean cold and snow but Karen and I were fortunate to arrive a couple of weeks after spring had settled in. With the warming, the surface melt creates bogs and shallow lakes that call millions of migrating birds and helps sustain animal life. The 24-hour sunlight inspires brilliant wildflowers and tender moss across the tundra, marking this amazing ecological transformation with swaths of colour. 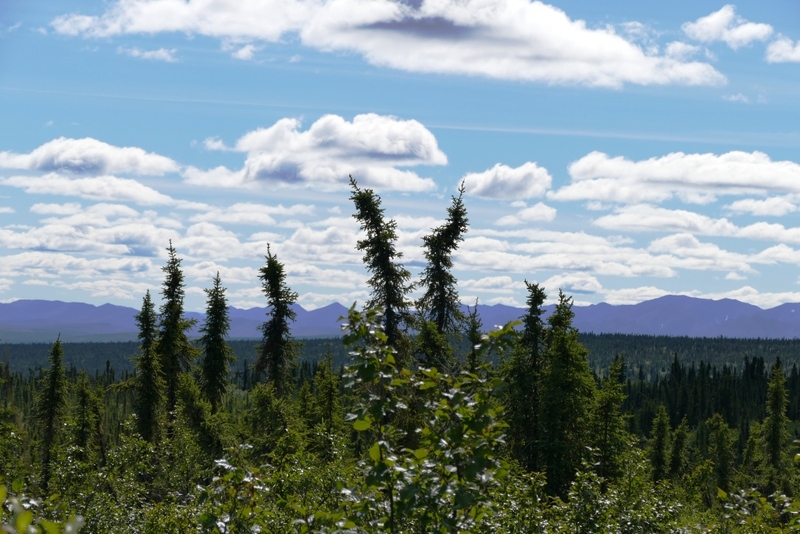 The black spruce –stunted by the short growing season, some limbs and heads twisted from longtime winds — lean with the influence of permafrost. We felt as though on the yellow brick road, an endless journey to uncertain wildness. 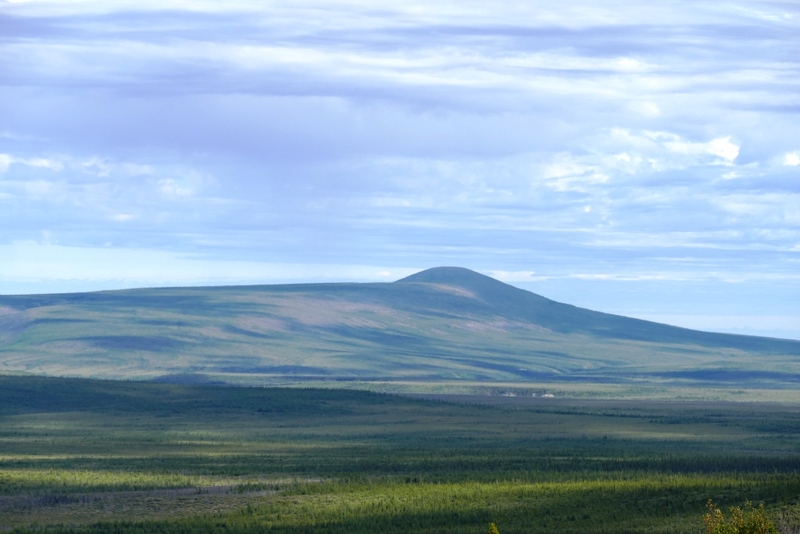 The only highway north of the Arctic Circle in Canada, the Dempster weaves through vast isolated landscapes and stretches itself beyond sightlines. 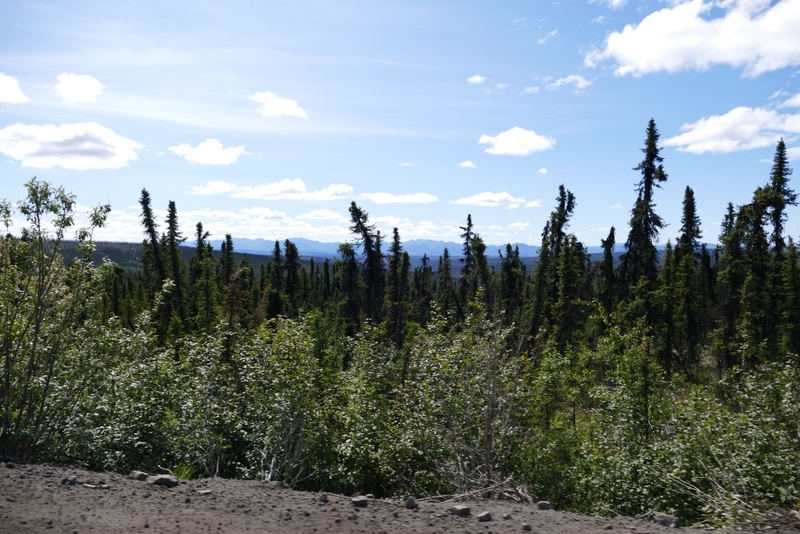 Remote with quiet beauty and change, we passed from boreal forest to tundra to fields of stunted spruce twisted and bowing before mountains that mimic the woolly mammoths that once roamed here. The North is wide open big. Creeks like lakes, ravens the size of dogs. Grasshoppers and geese are smaller yet appear dense — more substantial than their southern cousins. We are all vulnerable in this place of quick harsh change. Shall we take on the task of re-wilding ourselves? 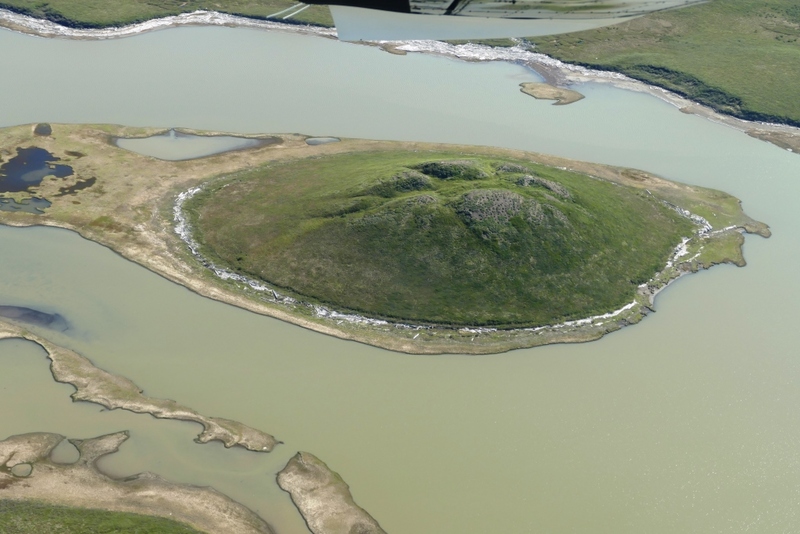 Following travelling, trade and hunting routes of the Gwich’in and Inuvaliut , the Dempster was constructed over a 21 year period (1958-1979). 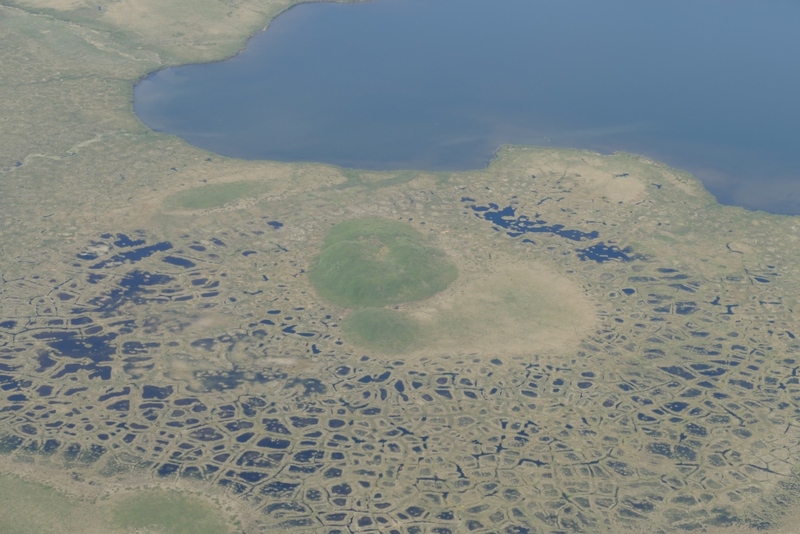 The permafrost of the tundra offered a unique engineering challenge for the road’s development. 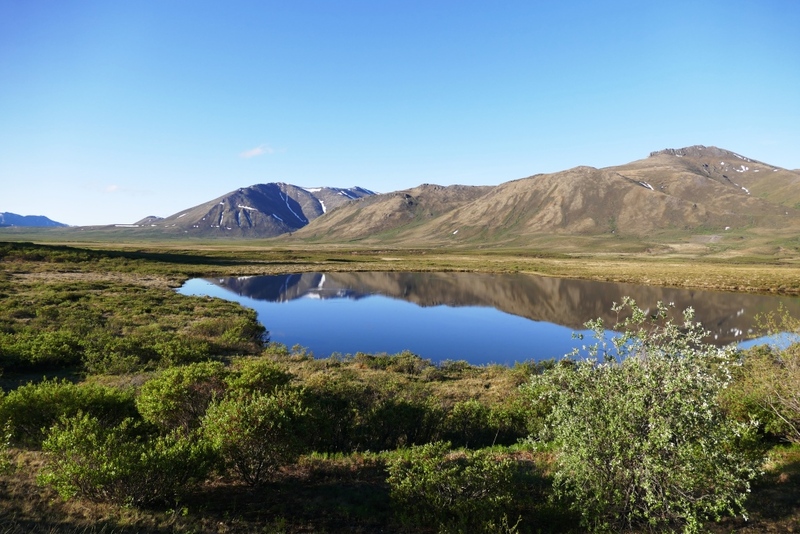 Permafrost is a mix of frozen plants and soil and can extend up to 450 metres below ground. 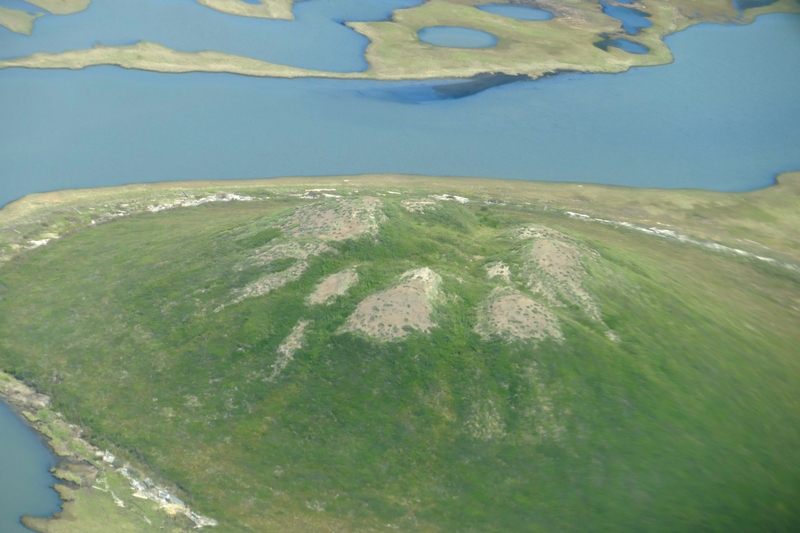 In the southern Arctic, the surface layer above the permafrost melts. The Arctic is a desert due to the low precipitation—the cold keeps the snow alive but each accumulation is actually little. There are no towns, no outposts nor services no settlements along the highway for almost 400 km. Throughout the North, we’d become accustomed to gas-stations for towns and towns that had been permanently closed. Our aim was Eagle Plains (population 8) which markets itself as “Where the True North Begins.” Leaving Tombstone, we looked longingly at the sleeping RVs. While we can filter clean drinking water from a dirty puddle, washing in such is not really an option. So, having not had access to running water for a few days, we were itching for the showers as advertised by Eagle Plains. 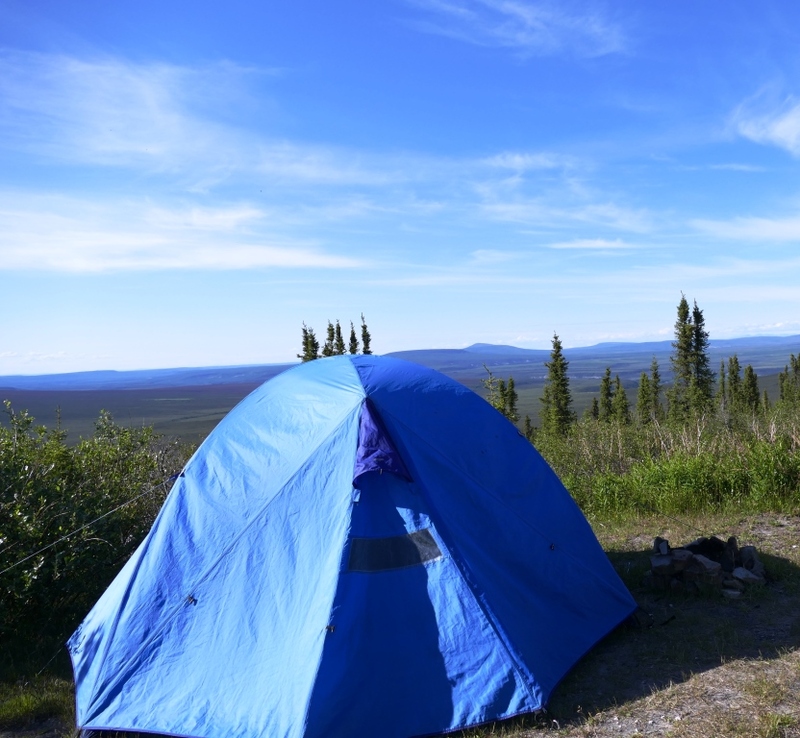 We pitched our tent in the Eagle Plains parking lot campground overlooking a tundra valley of endless rolling plains and distant mountains. Curious gray jays hopped alongside our roadmaps while ravens perched in pine called attention to the eagle passing overhead. We shower and dust streaks off our hands and faces in muddy lines. Our toes wary of the heavy plastic lattice base of the stall. I am reminded of standing on milk crates. Even through the duct taped shower head, the water is warm, strong and efficient. As we leave, the linoleum burps under our feet and we are pleased to retire the heavy road dust and make our way back to our tent for tequila before supper. We treated ourselves to a reasonable dinner and visited with a few of the 8 inhabitants of Eagle Plains afterwards in the bar. With a saloon like feel to it, the bar showcased many animal heads and hides including musk ox and lynx, a piano, pool table and cribbage board table. We asked about filling up with gas and the bartender explained that after 8PM, she doubles as the gas attendant. Chairs stained with comfort and long familiarity, the side door open for local dogs and smoke coming in from cigarette breaks. We chatted with one man from Hamilton who has been in Eagle Plains for a decade and loves it. He explained: In the cities, there’s nothing there—just people. To him, north of 60 is the North. Another young man had just arrived and told us that his roommate in Edmonton had found him the motel job and called on his behalf. (There’s a story there, I thought…) Imagine living and working and surviving through long winters with 7 others. 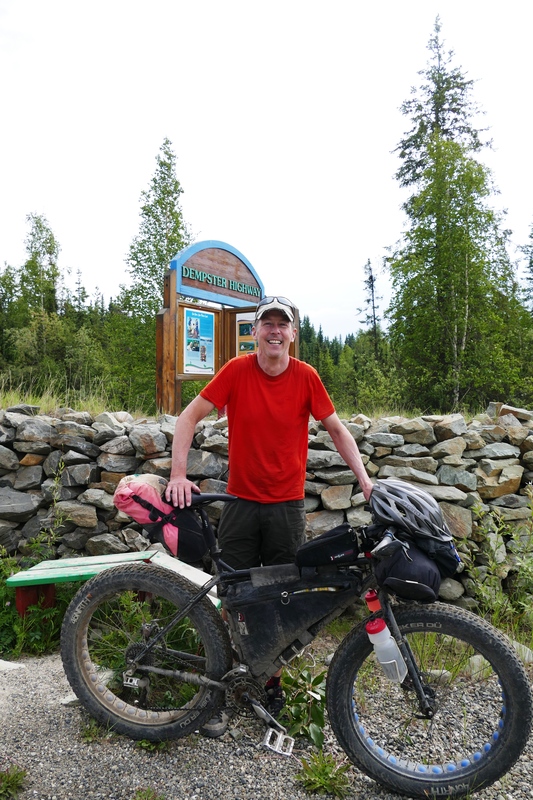 We stopped at the Dempster Highway signpost just as Malcolm was pulling in on his fat-tired bike stretching one arm up and shouting “I made it! I’ve done the Dempster!” Twelve days he spent cycling up north then down south along the windy and sometime slippery dirt and gravel road. 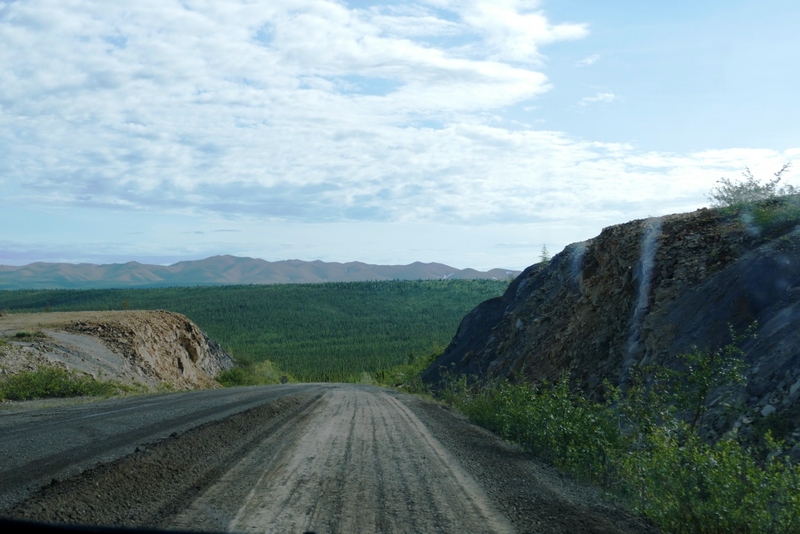 The 740 km narrow road is built on permafrost, dipping and curving through Arctic wilderness. In and out of mountain ranges and great tundra plains, it criss-crosses the continental divide. It was for this highway we brought the spare tires and 26-litre gas can. We’ve met many travellers on our journey, most in campers and RVs and we’ve passed women and men pedaling steep Yukon stretches all alone. When people in the camper vans and RVs look at us with our little hatchback and tent accommodations, they wonder how we do it. Meanwhile, Malcolm has all equipment and food on his bicycle! 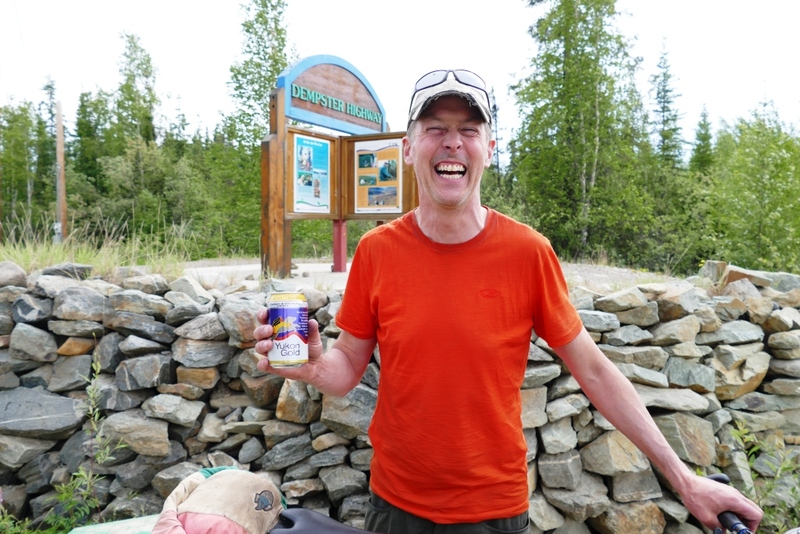 We were delighted to witness his accomplishment and he was thrilled with the cold beer we proffered in celebration. We talked about our journeys and the North. Malcolm is from St John’s Newfoundland and is in love with the North. To him, the North is magical– the vistas, the low population density, the outdoors all around you. 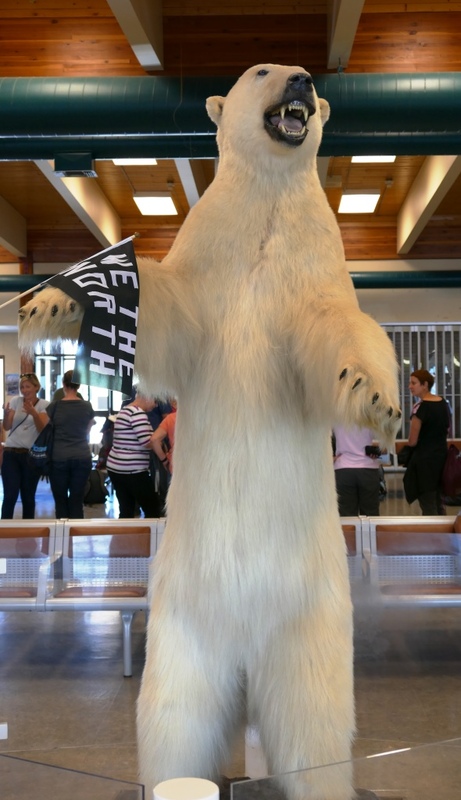 He considers North to be wild and has travelled into the far reaches of northern Labrador where polar bears reside. “Now that’s North!” he said. 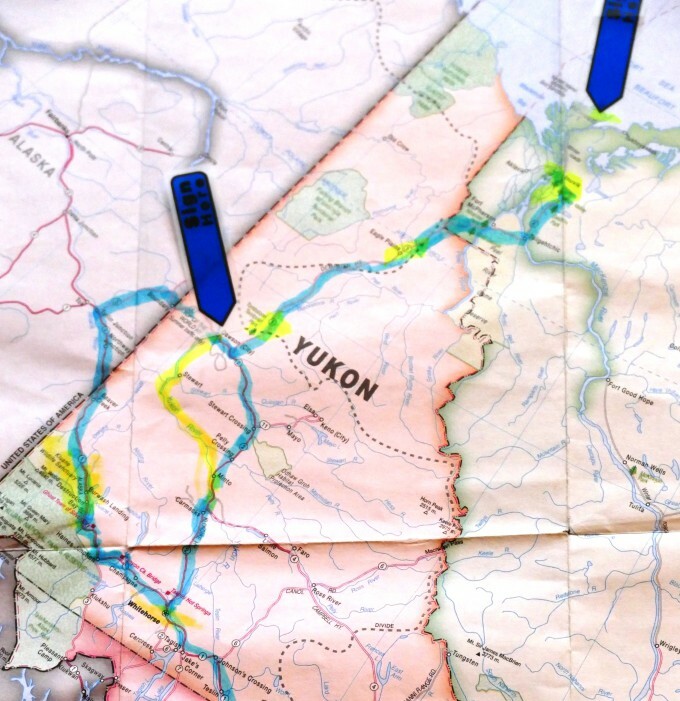 Back in 2006, when hiking the Yukon Tombstones, he decided to return to bicycle the Dempster. His blog: Slow Biker. 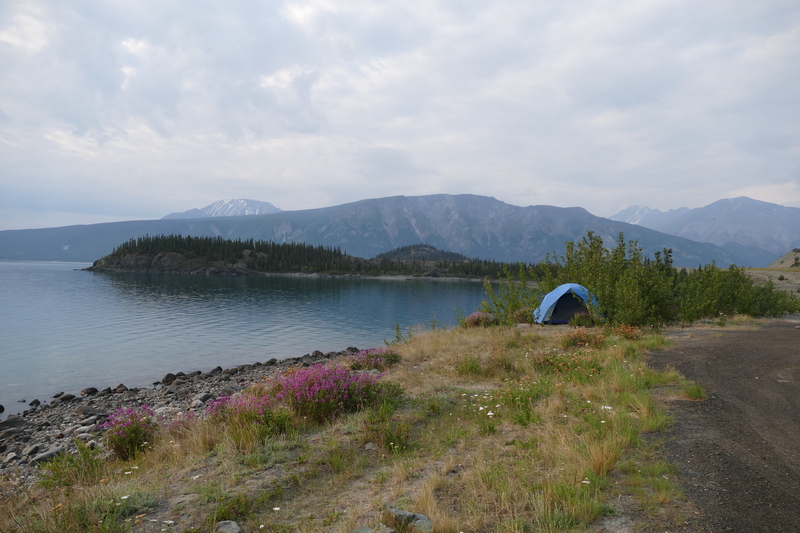 We left Malcolm savouring his Yukon Gold brew and set our sights on camping and hiking in Tombstone Territorial Park. In Tombstone, we’re told that a mountain resembles the way north. The Yukon Parks Going Up North info sign explains that “The higher up you go, the farther north you are. As you climb look up a mountain, the vegetation shrinks as conditions become more extreme. Watch for the same changes as you drive farther north.” Tundra to Taiga to Boreal Forest to Sub-Alpine to Alpine Tundra to Snow and Scree. 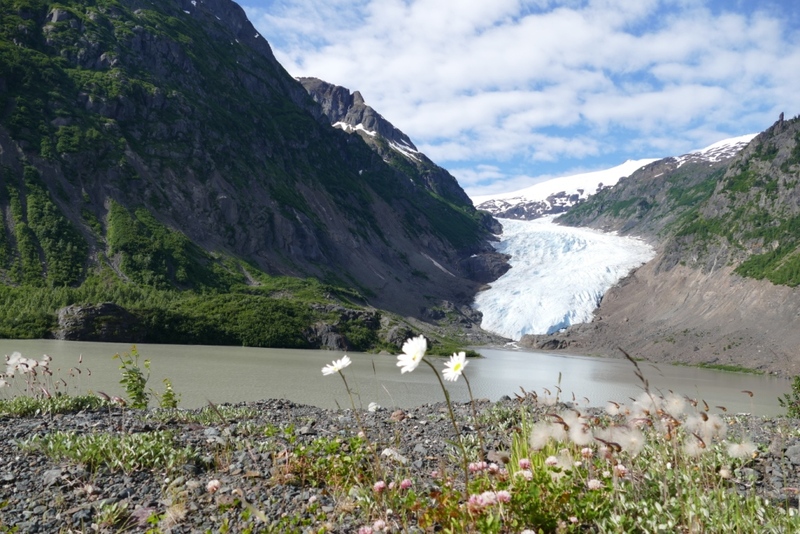 Tombstone: a fantastical place of mountain hikes, still snowy rivers and tundra. 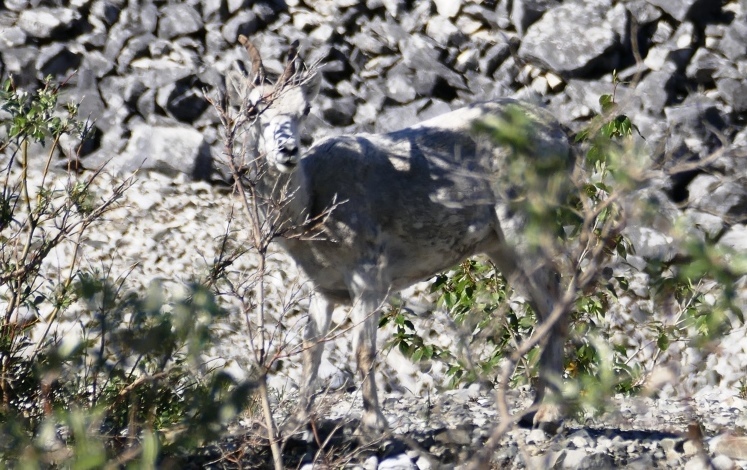 The continental divide passes through with its great spring and fall Caribou Migration and the shifting topography. An in-between place , our stay there gave us heat, rain, cool, and sleet. One night it warmed up around 11Pm when the sun came out. Bear warnings are vigilant including inside the outhouses and all the rangers carry bear spray with them–everywhere. We kept thinking is this just a liability issue—like really how bad can it be? and made jokes about bears knocking on the privy door. But then we talked with a ranger who said that indeed, grizzlies come into the campground which is why she will take anything food-related left unattended on your site–even cooking gear. Campers can retrieve their belongings at the visitor’s centre with a stern warning. Our early morning departure found us shaking ice off our tent and by mid-day we were commenting on the heat at Eagle Plain, just south of the Arctic Circle.